Why not celebrate British Sandwich Week (11th – 17th May) with a fundraising picnic. 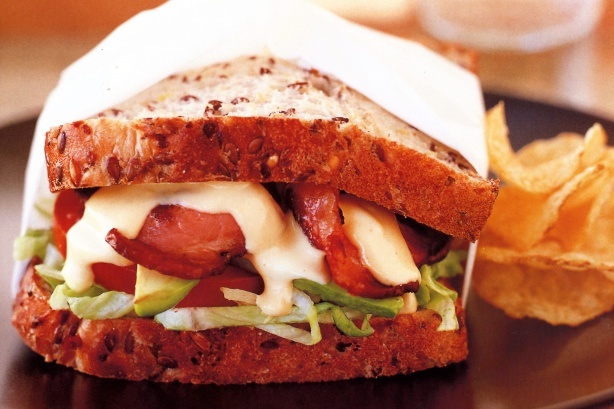 British Sandwich Week is organised by the British Sandwich Association in order to raise money for charities. You can join in the events of this week by organizing a charity picnic in the park – either ask everybody who attends for a small donation or (if you want to be more organised about it), make and sell a range of sandwiches to raise some money for your favourite charity. If you need some ideas or support, then check out the British Sandwich Association website and let them know about your event. The main ingredient for any picnic will be the sandwiches so offering some great sandwiches with a choice of fillings is essential for success. For a healthy option, use multi-grain or wholemeal bread or rolls which you’ll need to butter to stop the sandwich fillings from making the bread go soggy. Here are three sandwich filling ideas to get you started, but feel free to use your own special sandwich filling recipes that your family enjoys the most. BLT (Bacon, Lettuce and Tomato): Grill the bacon slices until they are as crispy as you like them. Wash and drain the lettuce (use a nice head of Romaine lettuce for extra crunchiness) and slice the tomatoes into slices slightly thinner than the bread slices you are using. Butter the bread and assemble each sandwich as follows: a lettuce leaf topped with a rasher of bacon then place tomato slices on top followed by another lettuce leaf. Pop the tops on your sandwiches, cut into triangles and pack. If you like, you can add an extra dash of flavour by using mayonnaise instead of butter on the bread (or add a dollop of mayonnaise to the sandwich). Tuna and Mayo: To make the filling drain a can of tuna chunks in spring water and tip contents into a bowl. Finely slice 2 spring onions and add to the bowl. Add 3 large tablespoons of mayonnaise and a teaspoon of lemon juice and mix roughly, breaking up the tuna chunks as you do so. Add some salt and pepper to taste and a teaspoon of chopped parsley. Butter your bread or rolls, pile on the tuna and mayo sandwich filling and add some shredded lettuce. Cover with the second slice of bread and wrap up ready to go. You can vary this filling recipe to suit your tastes by adding a tablespoonful of drained canned sweetcorn, finely chopped celery, or chopped herbs of your choice. Cheese and Tomato: Grate a bowl full of strong Cheddar cheese (or the cheese of your choice) and spread onto buttered bread or roll. Slice cherry tomatoes and blot on kitchen paper (to reduce sogginess) and lay on top of the grated cheese. Add salt and pepper to taste and a little chopped fresh basil. Pop the top on then wrap it up ready to go. You can vary the cheese sandwich options by using Feta cheese with a little olive paste or why not try cream cheese with a little Marmite and a sprinkling of chopped walnuts?